Advancing Time: Japan's Stock Market Held Up By BOJ Buying Stocks! Japan's Stock Market Held Up By BOJ Buying Stocks! For years Japan has been the poster child and living proof that low-interest rates do not guarantee economic growth and prosperity. Oddly with so much economic dislocation over the last decade, people seem to have forgotten the lessons we thought we had learned as Japan struggled. Now it seems the whole world is on a path that mirrors the same unsuccessful path taken by Japan since its bubble economy popped decades ago. It is a path that avoids real reform and bails out the very people that caused many of our problems. 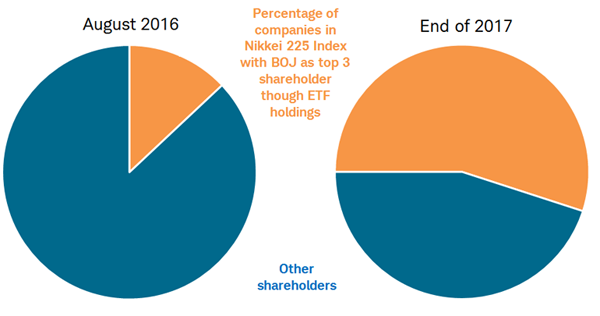 The BOJ has been pumping up Japan's stock market by buying into the ETF market. All this has morphed into a program that seems akin to fraud based on doing "whatever it takes" to give the appearance their economy is moving forward. Following along the line of thought that while there is no way of avoiding the final collapse of a boom brought about by credit expansion years ago, Ludwig von Mises wrote; "The alternative is only whether the crisis should come sooner as the result of a voluntary abandonment of further credit expansion, or later as a final and total catastrophe of the currency system involved." In short, the BOJ now has little choice but to go all in which strips away any illusion all is well. Before the "Bernanke has all the answers" era, many of us criticized Japan for failing to own its problems. At the time the idea was that only by letting its zombie banks and industries fail could Japan clean out the system and move forward. Instead, the Government of Japan ran huge deficits and ran up massive debt. For decades Japan languished and avoided disaster only by the fact that it enjoyed a large trade surplus year after year. Today much of that trade surplus has vanished but Japan's massive debt remains. Recent data shows overseas investors dumped the most Japanese stocks in 31 years in the fiscal year ended Sunday. Official market data shows these market participants unloaded about $50 billion worth of shares on a net basis. this was the second straight year of net selling and the highest sell-off since 1987. The reason this selling caused barely a ripple in Japanese stock prices is because the Bank of Japan's asset purchases absorbed all the bleeding. The near-record liquidation was matched nearly yen for yen as the BOJ bought 5.65 trillion yen worth of equity exposing its oversized role in the market. 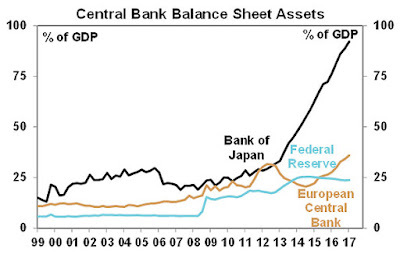 Central Banks have long pointed to stock markets as the leading indicators for regional and global economies. The fact that in 2016, the BOJ raised its annual ETF purchasing goal to 6 trillion yen and since then Kuroda unleashed an unprecedented stock buying rampage is a reason to doubt the validity of Japan's market. Currently, the BOJ's estimated aggregate ETF balance totals around 250 billion dollars. 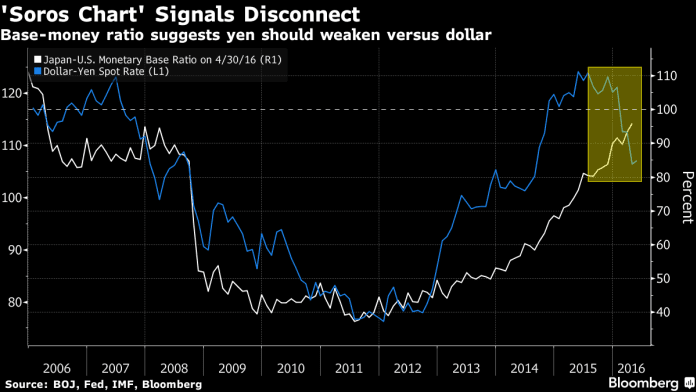 In some ways, the actions of Japan's central bank could be considered nothing more than a new model of "stealth nationalization." This is a course filled with moral hazard. Recently articles have surfaced exploring how the central banks and governments have distorted true price discovery in stock markets across the world. By buying stocks they are taking or transferring branch of industry or commerce from the private-sector to state ownership or control. The key word here is "ownership." This is because the state may choose to abdicate control over decisions leaving them in the hands of management. That being said, it is hard to deny that the person or entity that owns the stocks still controls its valuation as the "market maker" setting its price. Since true price discovery is the bedrock of free markets we cannot underestimate the importance feedback loops between assets prices and input signals play. These are critical in determining value, especially when it comes to assets such as stocks, bonds, currencies, or paper promises which carry no utility value and can perform no useful task. When true price discovery is lost or impaired management teams no longer get market feedback as to whether an executive decision is good or bad, this dilutes the market's ability to reward and punish companies no matter how disastrous their decisions. Instead, it masks signs and warnings of a company's demise. The fall of great empires throughout history shows states of unsustainable equilibrium cannot continue forever. This means that first and last price backstops become invalid and creates a situation where shareholders may rush to liquidate in panic. When this occurs authorities tend to halt capital markets indefinitely in a last-ditch attempt to make selling impossible, this creates a false floor under markets creating the illusion of value where it no longer exists. After 2008 Japan made the decision to put itself on the leading edge of an experiment to propel its economy forward. This includes the BOJ not only expanding its balance sheet but pumping up the market by jumping into the ETF market, what the country is not doing is taking big steps toward economic reform. All this has morphed into a program that seems to share a key focus on doing "whatever it takes" to keep the economy moving forward. The problem in pursuing the flawed policy of never allowing the market to slip but putting it on a path ever upward until everyone doubting the strength of the market finally capitulates is that it thwarts true price discovery. To keep the illusion alive central banks must continue expanding credit and debt so the wheels do not come off the economy. It would be rather hard to sell the illusion all is well if unemployment soars and defaults skyrocket. This means the central banks remain trapped in a box Ben Bernanke built and that Janet Yellen reinforced. A while back I outlined in an article how central banks through a stealth move were slowly buying equities and corrupting true price discovery. An interesting twist is that because money can easily flow across borders not all this is taking place in only the country where the credit originates. While a person can interpret all this as proof the markets are indeed rigged it also signals that any fall in prices is merely a signal for central banks to double down and rush in to buy more. It is easy to see how this feeds into a self-fulfilling loop of speculation. This falsely accomplishes two things, it bolsters and supports current holdings while reinforcing the image markets are climbing higher because our economic future is getting brighter which is a narrative mainstream media is glad to provide. This all started as a "short-term solution" but Ben Bernanke upped the ante by setting the bailout and money printing machines on high and flooding America and the world with QE. When other central bankers embraced this solution the world embarked on a grand experiment that never really gained traction. The key problem is momentum seems to ebb shortly after each new wave of stimulus and another fix seems to constantly be needed. Current policies are not creating true growth in productivity or real wealth but simply driving up the value of certain markets and assets. This benefits those who own or have assets but does little or even hurts the poor or those who have nothing. It also increases economic inequality and social unrest. You could say this lessens or reduces the impact of existing debt but this is generally true if we see massive inflation which causes wages and income to soar. It is important to remember this is a "high stakes" game and a strong incentive for central banks to continue on this course is that pension funds around the world are in serious trouble and any fall in their assets would be a disaster. As we continue down the path to nationalizing debt two enormous problems exist, the first is the economic growth lacks any real quality and the second even bigger issue is that under this policy eventually central banks will control or pretty much own everything at a distorted value they determine best suits their narrative or purpose. The good or bad news depending on how you look at it is that the plan may not work and it may come crashing down around those in charge of this great manipulation. All this is akin to a doctor telling a patient to double or triple his dosage when the medicine does not work. Policymakers across the world have entered uncharted waters that are full of peril. While global capital markets are now delighted by the recent U-turn in monetary tightening, it just makes the eventual moment of reckoning that much more painful. or click on the Follow button above. Footnote; Many economists fail to consider the strong the role China now plays in the Japanese economy. More on that subject in the article below. Waking Up To A World Done Saved!